The cottages are modern, clean and comfortable. The owners are helpful and friendly. The outdoor play equipment, pool and play barn are fantastic to keep the kids entertained. We had some lovely days out nearby and would definitely visit again. A lovely place to stay especially if you have children. There are plenty of things to keep them occupied and the cottages and grounds are kept to a very high standard. Well located for various attractions with lots of brochures provided to give you ideas of places to go. We had a great holiday thank you! What more could you want from these beautiful barns. The swimming pool was great, play barn caters for all ages, outside space to run around in, animals, lovely walks. Nearby beaches a short drive at waxham and winterton are excellent! Also Seals at horsey well worth a visit. Thank you Jill (owner) we had a great time, we hope to see you again soon. We had an excellent stay at lower wood farm and had both Bramley and Braeburn booked out for the week. The owners were very accommodating and even put on a halloween event for the children. The accommodation is very well equipped with all the essentials and more. The welcome tray was lovely and plenty of towels were provided. It would be nice if more toilet roll etc were provided throughout the week to save a trip to purchase some! The lighting good be better in Braeburn it was very dark even with all the lights on! The beds were comfortable and bedrooms were lovely dark. The play barn is excellent with many toys and games provided. Great location with ease to get around the local area, although many things were shut whilst there due to end of season we still found plenty to do. Lovely holiday and we hope to return at some point. We have just had the most wonderful week staying in Bramley Cottage. We were a family of four staying with a 5 year old and a 2 year old. The cottage was set up so well for children. The cot provided was a wooden cot, so it fitted our tall 2 year old. He slept fantastically all week. The single beds were provided with a bed guard and waterproof mattress protector- great touches so we didn’t have to bring our own. Plastic cuterly, plates and cups were provided. Even a step, nappy bin and night lights. It made packing and travelling with little ones so much easier. Our cottage was immaculate and had absolutely everything you could need for a week away. The facilities on site were just brilliant. The pool is warm and immaculate. It was great you could dry and leave your swimming towels and costumes at the pool. The boys loved the pool and the fact they could have a swim before breakfast. The indoor playbarn was amazing, our two couldn’t believe all the toys and spent a wet couple of hours on our arrival playing away. The outdoor play facilities and bikes were a huge hit too. The whole complex is kept in immaculate condition and is safe for the little ones to run around. All the staff we met and chatted to were very friendly and conveyed a warm Norfolk welcome. We thoroughly enjoyed our stay and look forward to returning in the future. Superb place to stay for families, especially with young children. The facilities were excellent and very clean. Third time staying at Lower Wood Farm, first time in Bramley cottage. We had a great stay again, everything was excellent and we have already booked again for next year. Absolutely excellent for anyone with small children. Lovely indoor and outdoor facilities. Really twin friendly too. An amazing holiday cottage with first class facilities. The pool was the perfect temperature for little ones and the changing area was immaculate. Playbarn and outside play areas were great and this was the most relaxing holiday we have had with our children. Please can you think about putting a couple of balance bikes to your collection. Thank you so much for such a great holiday. Lovely relaxing long weekend at lowerwood farm. We have stayed several times before and keep coming back. It is peaceful and relaxed setting with clean and comfortable accommodation. The children always enjoy the pool and seeing the horses. Beaches are only a short drive away and weather permitting are always a nice day out. Plenty to do on site plus great location for visiting various attractions within an easy hour's drive. Highlight was seeing seals at 0800 on Horsey Beach. Also great breakfast at Dune Cafe, Winterton beach. Slight boiler issue resolved swiftly once we made Jill aware - handy to have her on site. Jill and her team go out of their way to make your stay perfect, cakes on arrival, and a personal welcome as we got there. The cottage was beautiful, clean and has everything you need; you can even get supermarket shopping delivered to the cottage. The location is good, and while we stayed mostly on site this visit, the cottages are within easy distance of good pubs, restaurants and entertainment. Walks from the site are good. On site the pool and genes room are great, never to busy and fab for the kids. For us, a family of three generations, the single storey arrangement of converted barns around a warm, indoor swimming pool and a well stocked play barn, with swings and slides outside, was ideal. The furnishings were quite spacious and comfortable and there was plenty of hot water and central heating if needed. The surrounding countryside is attractive. A car is needed as the nearest shops are a couple of miles away. Lower Wood Farm is efficiently managed. Very good cottage, packed with nice touches such as a nappy bin, step fir the sink etc. Very clean and facilities outside cottage outstanding. Good for my 2 yo, lots of running around and toys to play with. Love Norfolk and Lower Wood Farm is definitely a hidden gem in Norfolk's crown! Great for children - wide open spaces for lots of playtime. Great for oldies - lots of walks and watching the sunset. We loved our stay at Lower Wood Farm. As a family with two young toddlers we found the cottage (Bramley) to be perfect with everything we could possibly need for our stay. The facilities and grounds are all beautiful. Jill clearly runs a tight ship and it's clear to see the amount of care and maintenance that goes into keeping the place immaculate. The pool is gorgeous and kept lovely and warm, we pretty much had it to ourselves each time we used it. The playbarn had every possible toy/tractor/dolls house/book to keep little ones happy for hours, whilst the outside play area was also fab with lots to do. There are also bikes of all sizes you can just help yourself to, it seems they've thought of everything. It is perfectly positioned too with plenty to do within a short drive as well as lovely walks straight from your door. We holiday every year in Norfolk and Lower Wood Farm is without doubt the nicest place we have stayed. Lovely stay , excellent place to stay. Everything clean as you would expect. Stayed in Bramley cottage for 5 days over NYE -a group of 3 adults, 2 children and an infant. Very comfortable cottage with plenty of space, beds were comfortable although very high off the ground for the young children but just a minor point. We were very helpfully given a bedguard to ensure their safety. KitChen was well stocked and plenty of storage in every room. We absolutely loved the facilities in the grounds, the pool is lovely and the perfect size for all the guests, we swam at least once a day! Very organised with changing areas and clothes drying area. Children loved the play barn as well and it was great to have somewhere to escape to on rainy days. Everywhere was clean and tidy and well thought out. We hope to return one Summer so we can enjoy the beautiful outside spaces too!! Excellent facilities. The swimming pool and play barn are fantastic. Everything thought of in the cottage to make a stay with small children very easy. Would be great for groups of families too. Came with my wife and children aged 4 and 7. The cottage was very clean and in a quiet location in the Norfolk countryside about 2 miles from the coast. Its a short drive into Caister. The play barn is great for the kids and even adults as it has pool table and table tennis, games, toys and a sitting area. Swimming pool was good to have too and the kids loved going and having a swim every day. Had the pool to ourselves most of the time. Large outside play area too with lots of activities to keep the kids occupied. The owner Jill even organised a trick or treat event while we were there which was really good. Great place to come with your kids. Very comfortable and we hope to return next year. The swimming pool was excellent and Jill was very friendly, as was the gardener. Very good facilities, the cottage was a home from home. We decided not to holiday abroad with our 20 month old, and having been to centre parcs before, were looking for a holiday with more for younger children to do. Lower wood farm was perfect - everything is tailored for young families. Our daughter loved playing with all the toys in the play barn, swimming in the pool and on the swings and climbing frame in the gardens. We were lucky that the weather was great and we could explore the beaches and local area too. We stayed for a week, and loved it. Everything is spotless and well maintained, and our cottage was comfortable with all necessary amenities. We will be back! We have just returned from Lower Wood Farm and are already looking at dates to go back again! It was lovely. A really nice clean, well-equipped, comfortable cottage to use as a base for our holiday. We used the on-site swimming pool every day - it was so handy and we usually had it to ourselves. The kids also loved the play barn and the outdoor play facilities - all perfect for toddlers which made it easier for the adults to relax too. We would highly recommend Lower Wood Farm to anyone with young children looking for a clean and comfortable home from home. A wonderful location with great facilities. Jill was accommodating and able to deal with our queries and was helpful with suggestions as well as managing our group booking. The facilities at the location are excellent and the place is immaculate. We enjoyed ourselves so much we may well head back again next year! Lovely, clean, comfortable cottage with excellent facilities on site for all ages. Easy access for the Broads and the coast. We would definitely hope for a return visit in the future. This was our fourth visit to Lower Wood Farm. In reality, those 9 words tell you all you need to know. On each visit our children (now 2.5 and 5.5 years old) have had a fantastic time which means we have too. Bramley Cottage is very homely and the kids love the pool, play barn and outdoor toys. What I especially like is that Gill constantly reinvests in the business so appliances get replaced and new toys arrive so we have never felt that our loyalty was being taken for granted. Gill herself is quite amazing - amuse yourself by counting how many different jobs you can spot her doing during your stay! This is our second visit to Lower Wood Farm and a year on everything was still in excellent condition in the cottage with little sign of wear and tear. As before the cottage was spotless and the welcome cakes were delicious. My children adore the swimming pool and the play barn and whilst we had a couple of wet days where we didn't go off site it didn't matter as we spent all our time in making use of the brilliant facilities. We hope to return again next year. We actually stayed in Braeburn Barn - there was a problem with the hot water in Bramley that couldn't be fixed until the day after our arrival so we were given the option of changing cottage. Not the owners fault, she hadn't been told by the previous occupants that there was a problem and she did everything she could to ensure our holiday wasn't affected! Excellent place to stay, lovely clean and comfortable cottage. Nice location and swimming pool was great. The owner, Jill was very friendly and helpful. Would highly recommend this place! We had a lovely few days and found the cottage and surrounding areas delightful. The pool was very enjoyable warm and very inviting. The accommodation was excellent and we would return with no hesitation. A wonderful time had by all. We loved Lower Wood Farm. The cottage was lovely, absolutely spotless and yummy cakes and tea on arrival. Our 18 month old was well catered for and loved the playbarn, outdoor play area and swimming pool. We used the catering service on the first night which was delicious. Brilliant time. Wish we could have stayed longer. We had the most wonderful family get together. 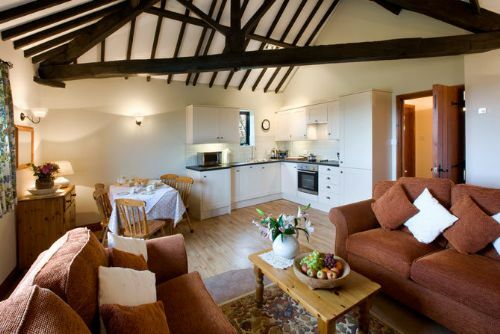 The cottages were outstanding in cleanliness and comfort and the facilities were of a very high standard. The five children from 3 to 10 years were kept happy all weekend because there were so many things to do. It was nice not to use the cars at all. Beautiful cottages and surroundings. The children loved it. Beautiful and spacious cottage set in lovely grounds of lower farm. Great to have the playbarn, park and swimming pool at easy access. We really enjoyed our stay. An enjoyable stay, thoroughly enjoyed by all. The cottage was exceptionally clean and comfortable. I will be recomending this to friends and family. Once again we have had a lovely two weeks at Lowerwood Farm. Well cared for accommodation with friendly onsite help if needed. The pool is fantastic and a treat to use especially if the weather is not at its best - the play barn and outdoor equipment keep the younger members of of our party amused. Quiet country walks away from the bustle and traffic. Already looking forward to our next visit. We are a family of 5, kids aged 5, 3 and 1 and Lowerwood Farm is a brilliant place to stay and has plenty to keep them entertained in rain or sunshine. We stayed there with family with older children, 9 & 11 and they were well entertained aswell. The pool facilities are excellent with easy to enter stairs which are great for young kids - do take your own flotation aids - and well thought out and provisioned changing area. The play barn is extremely well stocked for young children it would be nice to be able to take a cup of tea or coffee but no food or drink is allowed, this is a very minor gripe as it's no hardship go back to your cottage for refreshments. Although situated down a quiet farm track the supermarket is only 5-10 min easy drive (we saw Tesco, Sainsbury and Waitrose delivering). The location is further down the Norfolk coast than we have previously been and we preferred the more northerly beaches but Lowerwood facilities are perfect for our current needs and are well thought out with loads to do. Everything about Lower Wood Farm was perfect, the cottage we stayed in was immaculate, had everything we needed and felt very spacious even though it was one of the smaller properties. Whilst we went out and about during our stay the children would have been quite happy to never leave the Farm with all the toys and the playbarn to enjoy. The swimming pool was the icing on the cake and again was immaculately clean. Whilst every cottage was occupied none of the communal areas felt cramped or noisy. Jill was a super host and the welcoming tea and cakes was a wonderful gesture. We would definitely return again and have told friends and family about our stay. We had a lovely week at Bramley Cottage, Lower Wood Farm with our 1 and 4 year olds. The accommodation was excellent, catering perfectly to families. We particularly appreciated the swimming pool and play barn. And the location is perfect, with lots to do within a half an hour drive. Thank you! Amazing facilities, we had a great stay. Our cottage was lovely and our boys had a a fabulous time. We were also near the beach so has a fun family day out. The location & extensive children's facilities make this the perfect place for a relaxing family break. Swimming pool & playbarn keep young children amused, whatever the weathet. The accommodation is a real home from home for any family. We came down for a wedding with family and friends. It rained a lot, but the great facilities, with the pool and play barn, meant it did not matter. Our granddaughter had a wonderful time and would have happily lived here. This must be a great place when the weather is better as there is so much outside space as well. Thank you for your review. We are so lucky to be located in a wonderful area. So pleased you had an enjoyable stay. This is the second time that we have [ wife & 2 grandchildren ] stayed at Lower wood farm, and as before, it was the same high standard. Short break stay and one day the weather was terrible, but with the games room and the pool on hand we had plenty to keep ourselves occupied. Lovely place, nice and quiet, would recommend Lower Wood Farm to anyone. Lovely to meet you again. Thank you for completing our review.